UT Idea Lab | Kaleidoskoop is waiting for exciting business ideas! Kaleidoskoop is waiting for exciting business ideas! On 13th of December at V Conference Centre takes place South-Estonia’s biggest business ideas competition Kaleidoskoop pre-selection round. All student teams with business or project ideas are welcome to apply. Registration is open until 11th of December at UT IdeaLab’s webpage. 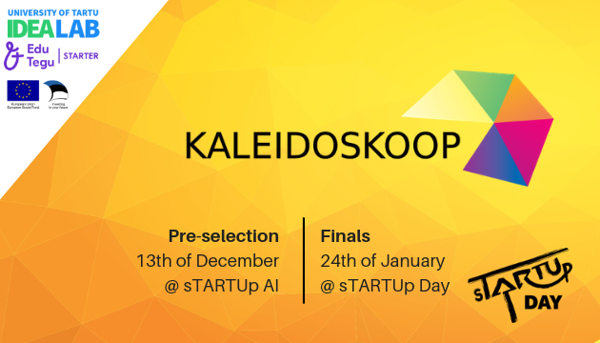 From Kaleidoskoop pre-selection round 10 best teams will be selected to go to Kaleidoskoop Finals at Startup Day on 24th of January. Top 10 will compete to win awards like participation in the European Innovation Academy in Portugal, tickets to startup and technology conference Latitude59, financial awards from Tartu City Government or 2-month access to co-working space Startup Hub. In addition, two Starter teams will get to pitch at the Starter national business ideas competition the same day. All business and project ideas are welcome to apply for Kaleidoskoop. Half of the team members need to be students from university or school. Each team will get 3 minutes to pitch their idea and after that a few minutes to answer questions from judges. At pre-selection round, a pitch can be either in English or Estonian but during the finals, all teams must pitch in English. 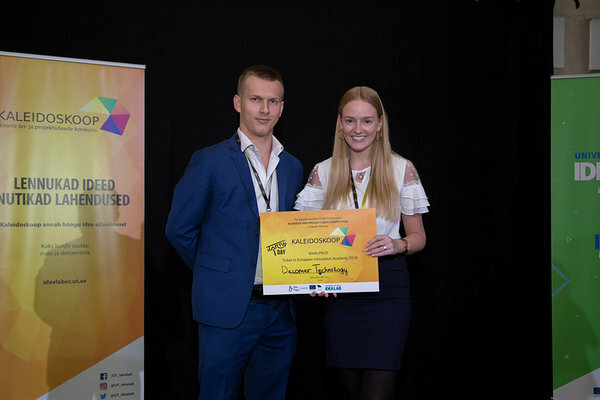 Last year at Startup Day team Decomer Technology, that is working on polymer capsules that contain honey and dissolve in water, won both Kaleidoskoop and Starter pitching competitions. After that, they got 4th place at the biggest Estonian business ideas competition Ajujaht. Currently, they are developing their product and were selected among top 10 at Prototron Fund. Kaleidoskoop takes place together with Startup AI (Artificial Intelligence) conference at the V Conference Centre. It is the second event of Startup Talks conference series and its main topic is a realistic view of AI. More information and registration at the UT IdeaLab webpage.